Tournament players will love the one of the 8, 9 or 10-pack options. The usually feature three pockets capable of holding up to nine racquets. Often one compartment will feature ThermoGuard insulation to help protect your racquets from extreme temperatures. The other two pockets and exterior accessory compartments are capable of holding everything from an extra pair of shoes to sweaty clothes (many come equipped with a moisture-proof pocket). Backpack straps are also a common feature. Check out our 8-pack, 9-pack, and 10-pack pages today to choose from our wide selection! For the most committed players, the 12-pack (also known as a Supersix or Supercombi bag) will be the way to go. With one compartment (approx 3-4 inches wide) big enough to hold 3-4 tennis racquets (and often equipped with ThermoGuard), this is the largest of the racquet bags. Great for tournament travel, 12-packs feature extra perks like backpack straps, shoe compartments and multiple accessory pockets, making it great for a long day at the courts. Don't forget to look at our 12-pack page today to choose from our wide selection! The 15-pack option has 12-pack features with slightly more space built in to the three main compartments. Some versions even come with golf-bag style stand-up legs! 15 pack tennis bags are also usually the top of the line bags from each manufacturer so they will have the most features and the highest quality. Check out our page 15-pack today to choose from our wide selection! Rolling tennis bags are great for players that like to take their tennis gear with them on long trips. With enough room to store in excess of 12 racquets or as much gear as you can cram in, these aren't your average court bags. Usually coming with a telescopic handle and smooth wheeling motion, these bags are easy to transport. Plus, firm carrier straps offer versatility when wheeling won't work and you need to carry or lift this bag. View our page Rolling Bags today to choose from our wide selection! The racquet backpack is another great option for players hitting the court on an intermittent basis. Backpacks usually feature enough room to fit one or two frames, and they can be a comfortable alternative to the longer racquet bags that hang off the shoulder. These compact carriers often feature compartments for water bottles, tennis ball cans and accessories. Browse our Backpacks page today to choose from our wide selection! Looking for something simple and stylish to carry your tennis gear? Tote bags provide the perfect solution. 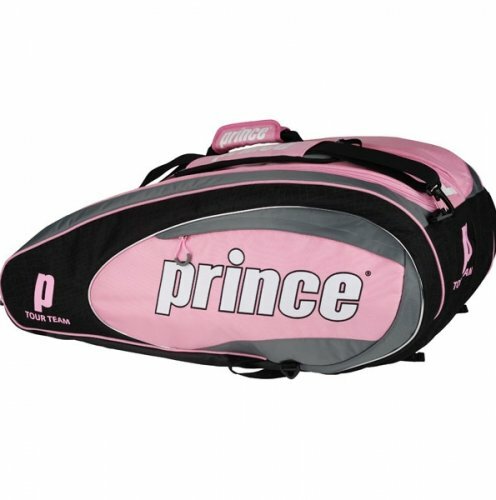 Featuring strong shoulder straps and eye-catching designs, totes can add personality to your game while easing transportation of your racquet, tennis gear, and personal items. If you think a shoulder tote is right up your alley, check out our Shoulder Tote page today to choose from our wide selection! Tournament bags are usually the same size as a 6-pack tennis bag. They typically are bags that consist of one to two large compartments suitable for carrying several racquets and some additional gear. They also don't usually have backpack straps, but rather carrying handles or one main shoulder strap instead. View our Tournament Bag page today to choose from our wide selection! Duffle bags are a great way to carry around your extra gear in.They aren't quite long enough for putting your racquets in, but if all you need is some extra room to carry gear in then a duffle bag is a great way to do that. Don't forget to look at our Duffle Bag page today to choose from our wide selection! Bag bumpers are a great way to protect your racquets against dings, dents, and scratches when jostled in your tennis bag or to simply be used alone as a lightweight way to transport your sticks! These stylish, yet simple covers can also be used to organize your racquets if you have racquets with multiple tensions. Browse our Racquet Bag Bumpers page today to choose from our wide selection! College bags are a great way for you to show your college spirit! These specialty 6-pack tennis bags feature the logo of some of your favorite universities. If you think a college bag is right up your alley, check out our College Bag page today to choose from our wide selection! This article lists professional tennis records relating to aces. In tennis, an ace is a serve that is not returned by virtue of the opponent's racket never touching the ball.